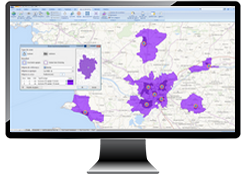 Our Geo Business Intelligence solutions combine your business data with geography : it converts your information into visual representation. Mapping out key performance indicators over an entire operational region enables you to capture regional activities at a quick glance. In addition, you will often identify patterns and trends in your business data which you wouldn't notice otherwise. Many of the correlations between market characteristics and sales performance happen along the geographical dimension. Displaying these variables on a map as a thematic view highlights these correlations naturally without any need for statistical analysis. From socio-economic census information to real-time market analysis and competitors information, businesses mostly rely on external sources of information to feed their performance analysis. Mapping out this data brings a comprehensive understanding of market trends, by putting together all the puzzle pieces on a single visual environment. By superimposing key performance indicators on contextual information, you can then make a direct link between performance and market potential, thus creating a wealth of new information to analyse your business. Inserting maps in reports and dashboards makes it much more attractive for your managers to analyse their market and performance. Maps have the visual power to attract and retain attention, thereby convey comprehensive information at a glance. Using maps to track performance allows computation of a new range of indicators, such as market coverage, penetration rate around point of sales, and location-based market potential. These indicators can be computed by mapping out your business operations. They provide new insights on understanding customer acquisition & sales performance. Our mapping intelligence tools can optimize all parts of your company organization. Thanks to mapping, all the geographical information stored in the company’s information systems becomes a fully-fledged source of knowledge and competitive advantage. Analysis, optimisation, modelling and simulation are at the heart of geomarketing. 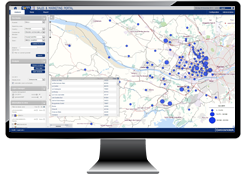 Mapping and data combination allows a wide range of applications : site selection, network management, geomerchandising, prospecting, customer retention, managing operations on the field (sectoring, appointments, delivery) and performance analysis can all optimised. You want a Reporting tool with mapping visualization ? Reports for Geoconcept gives you all you need to build the templates that suit your business and publish beautiful reports in a few clicks. 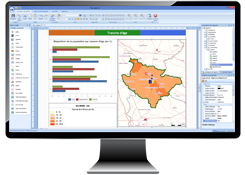 Reports for Geoconcept is based on Geoconcept’s core Geographical information system and contains a Module-base template builder with thematic maps, legends, text, tables, and graphs blocks. 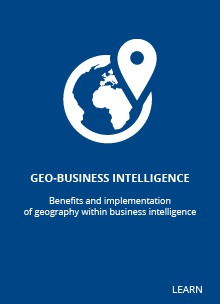 You are looking for a powerful business intelligence platform that offers geography dimension ? Our solution Sales & marketing Portal a full fledge light business intelligence platform to track performance and publish reports. Equipped with an OLAP engine, Sales & marketing Portal enables users to generate indicators they want to visualize on the fly thanks to a system of filters. Reporting capabilities, with map, graph and table publishing, are included in the platform. Discover our range of expert modules for geomarketing, a complete array of geomarketing tools to conduct analysis and prepare maps prior to performance tracking.